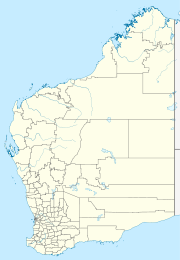 Wurreranginy (also known as Frog Hollow) is a small Aboriginal community, located 30 km south of Warmun in the Kimberley Region of Western Australia, within the Shire of Halls Creek. The original residents of Frog Hollow moved to Wurreranginy in 1981 from Guda Guda, near Wyndham, where they had gone to live after being expelled from cattle stations in the early 1970s. The people of Wurreranginy are Kija speakers with a mixture of adults, pensioners and children being present in the community. Children of school age at Wurreranginy attend the Purnalulu Independent School. The school enrols approximately 32 students in years K-10. Wurrenraginy Layout Plan No.1 was prepared in accordance with State Planning Policy 3.2 Aboriginal Settlements and was endorsed by the community and the WAPC in 2005. The layout plan map-set and background report can be viewed at Planning Western Australia official site. The community is managed through its incorporated body, Wurreranginy Aboriginal Corporation, incorporated under the Aboriginal Councils and Associations Act 1976 on 28 May 1986. This page was last edited on 11 June 2017, at 16:07 (UTC).